I'm a Joel Lover like many techies folks, and his job board is really tickling me. 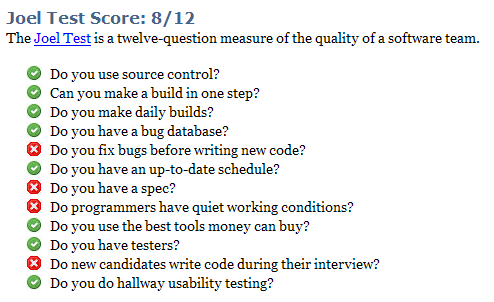 I just cruised the engineering ads (no, I'm not looking for a development job :-) and saw the the little questionnaire at the bottom of the page that measures the quality of the team hiring. Apparently people posting ads are answering honestly, which is excellent! And even more excellently, usability testing makes his list. Do you develop from specs written by designers? Do you have a design process with low fidelity work that is reviewed and refined before final specification is produced? Do you do usability testing during design or only after shipment? Do you change your design based on the results of user testing? Do you measure customer satisfaction with the product, including measures of user experience such as appeal, learnability, ease of use? Do designers talk to customers directly on a regular basis? Are developers involved in the design reviews and process? 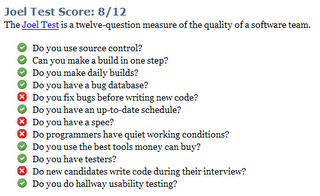 Does QA test for specification compliance? Is there a dialog about business requirements and product features that includes design staff? Do you require a design test and portfolio review during interviewing? Are other designers involved in interviewing designers? Are deadlines for specifications realistic and staged with multiple deliverables; or do you have single dates and one large spec document? Is your dev process sufficiently flexible to allow for design revisions without breaking everything and everyone? Are designers considered crucial to your business and to your developers? Regardless of the answer, how do you know if they are or not?